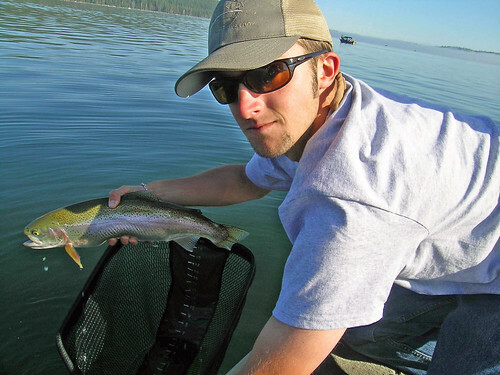 Caddis Fly employee Clay Holloway has had two good weekends fishing Diamond Lake in a row. Water temperature yesterday was 60 degrees. Clay said they caught fish on sparse bodied chironomids in bronze and burgundy, tied with midge-bodi by Spirit River. The fish averaged 15 but a few were larger. Minileeches were also producing, tied with a black marabou tail, black chenille, and red wire. Clay was primarily fishing with 10ft of 4x flouro. Crowds were down compared to Memorial Day weekend, plenty of fish to go around. 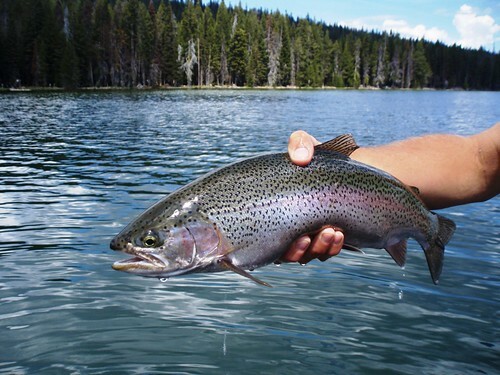 This entry was posted in Fishing Reports, Oregon High Lakes. Bookmark the permalink. I love that top picture. The purple, lavendar and blue colors in the fish and the backround are beautiful. Great job guys. No wonder I moved from Utah to Oregon! !